Much has been made recently about one of the stand out trends of the times we live in: Everything is becoming infused with technology. Software is eating the world it is said. Some have claimed that next it might even eat the jobs, which to some degree is almost certainly the case. With only a little bit of irony, Hugh MacLeod humorously noted this week that software may eventually eat all the people. But even that could be a bit closer to the truth than some of us might expect. Social media is relentlessly chipping away at the power and control that companies and governments have long enjoyed almost exclusively over the rest of the world. Supply chains, talent management (hiring), customer service, product development, and just about every function of business is being transformed by things like 3D printing, social recruiting, customer care communities, crowdsourcing, to only name a few of the more important examples. That’s not even looking at the macro changes (example: Arab Spring), in which digital/social is impacting the fabric of entire nations. In all of these cases, the power and control is shifting to the other side of the network, to what many now call the ‘edge’, where most of us are. Unfortunately, there remains a constituency that remains stubbornly in the back of the pack when it comes to the large scale changes happening in the world today. Surprisingly, this constituency formerly used to actually lead the technology world. Instead, it is now dragged along by consumer technology companies and their customers. Yes, I am referring to our corporations, to which I’ll add our institutions, including our governments and associated entities. I’ve explored many times in recent years how traditional businesses have essentially lost the leadership mantle when it comes to technology. But finally now there is an increasingly concerted effort to take some of it back, to get back in the game, to use the realization that the methods we’re using in large organizations to apply technology to work is often failing, and badly. This has led us generally to a broader global discussion on the future of work. With our institutions, expectations, and behaviors undergoing a steadily increasing rate of change, where is all this taking us? 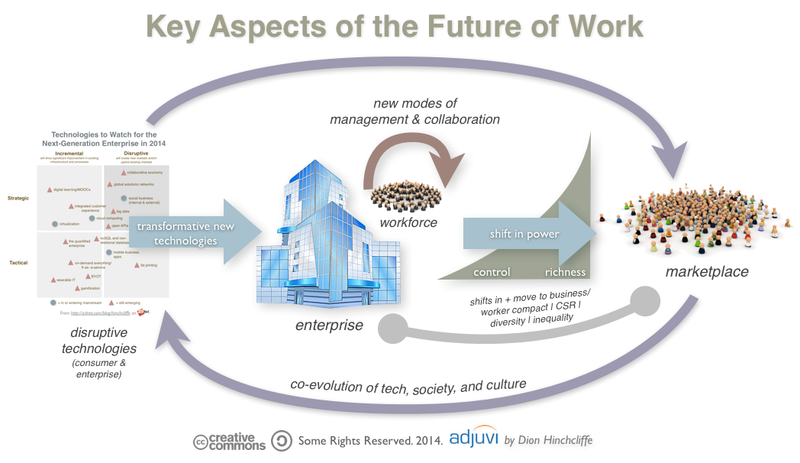 What will the workplace of the end of the decade look like and work like? That has been a question that’s been coming up more and more frequently. The answers are often focused purely on the externally obvious — and their easily determined — differences, such as the wide range of disruptive new technologies moving into the workplace today. While the technology is certainly a subject of fascination and I’ve been talking recently to audiences around the world about it, it’s not enough. We must move the conversation up a level and talk about the changes to us, the people that make up our workforces and our customers, and which are taking place as our businesses move deeper towards a very different 21st century model of work. The evolution of the business/worker compact We are on a trajectory that has taken us well away from lifetime employment, guaranteed pensions, and single careers where largely benevolent, parent-like corporations looked after their workers, to a model where the principle actors, both companies and individuals, are much more autonomous, self-interested, and dynamic. Like all things this has trade-offs, but in the large this directly facilitates more rapid evolution of those involved and potentially creates a richer, more rewarding — if seemingly riskier — work environment for us, especially if we’re self-actualizing. There are other implications as well. CSR/social enterprise and the need for business to go beyond a basic value proposition. It’s not good enough just to sell products and services anymore. Companies and their workers must be thinking about the bigger picture as the marketplace is increasingly demanding that the businesses they work with are concerned about overall global outcomes. Sustainability, environmentalism, corporate social good/responsibility, and other urgent qualitative matters of policy and governance are going to increasingly infuse how we work. Doing this successfully will require a very different mindset in our workforce than our traditional organizations typically have cultivated in the past. New modes of management and workforce collaboration. The management theory — or more likely theories, plural, as there are probably several good ways of thinking about it as I’ve recently explored — for the future of work is starting to emerge. The same with team, department, company-wide, and mass collaboration. Then there is the collaborative economy that is genuinely remaking very concept of how business works for the digital era. Read some of Harold Jarche’s latest musings on work to get a sense of what the mechanics might look like, as well as Stowe Boyd’s recent thoughts on going back to the fundamentals with social business thinking. New transformative workplace technologies. Everything from wearable tech to mind/machine interfaces and increasingly commonplace social business tools are changing how we will work. This will further change expectations and possibilities. I’ve explored the important technologies to watch this year, but there are many others in the wings and they will only come faster and be increasingly impactful. Our businesses are also becoming platforms in every sense of the word, becoming technologies in their own right. As Fred Wilson observed yesterday, it’s increasingly urgent for organizations to find — and become — the next platform. New approaches for addressing diversity and inequality. While still I’m on the fence about the best ways to address these, you can be sure there will be enormous investments made through the rest of the decade by businesses, government, and other institutions to start tackling the structural issues in the global economy. We’ve increasingly learned and come to accept how much they impact business performance and the bottom-line. A shift in the fundamental relationship between workers and business. This can be most clearly seen in the inversion of the traditional model of business, realized directly by the flourishing of vast numbers of self-organizing online communities. Now people can just come together online and create shared value without an intermediate organization that would otherwise have to the resources required to meet their needs. What does this mean for how important the traditional model business and work will be to people? The classical enterprise clearly isn’t as necessary as before for many purpose. Now we need to look ahead and see how these trends will affect how we structure, manage, and operate our organizations. Co-evolutionary changes in society and global/regional culture that impact the workplace. Technology improves what’s possible by dramatically lowering the effort, time, or cost of doing something, or even makes something entirely new possible that was simply impossible before. This sets expectation and enables/encourages new types of behavior in people and society as a whole. These soft changes in us then drive the exploration of new technologies guided by behavior changes and new norms. We need to better understand where this co-evolutionary process is taking us, as well as anticipating how these new directions will impact it will affect our businesses. Surely, this list is fairly incomplete. Unfortunately, more change is taking place now than we can really individually know (and is one reason why I believe locally autonomous adaptation is essential to the future of work.) Given how disruptive change has been in the last 20 years, remaking industries, creating giant new entities (Internet, Web, and cloud ecosystems like Amazon, Google), and dramatically changing what’s possible, the next-generation of work is likely to be almost radically different, while also being incredibly interesting. It’s worth it for us to find out as much as we can so we can prepare and anticipate the future, with the goal of avoiding unnecessary disruption — preferably being the author of your own disruption — while capturing increasingly historic opportunities. 6 Responses to What is the Future of Work? IMO, you, and the Future of Work, need to rethink this manifesto not in terms of work, but in terms of employment, i.e., what is the new wealth creation? The US economy is a culture of small business, not ginormous enterprise. In addition, the 0.3% big ‘enterprise’ firms employ over 65%, or most, of the minimum and low-wage workers in the USA. Thus, “Key Aspects of the FoW” has little/no/trailing impact on the vast majority of these ‘enterprise’ workers (Wal‐Mart, Yum! Brands, McDonald’s). They simply do not participate in the ‘collaborative economy’ and other lofty concepts. Meanwhile, it really isn’t that important *how* work gets done, which seems to be the main concern. Rather, the seismic shift is in *WHAT* needs to get done, what is the new _wealth creation_ (work-employment) for the rest of us, the 99.7%? The Industrial Revolution and Information Revolution (1957-2007) are both sooo over. Yet, 20th Century pundits and The Establishment still cling to these obsolete paradigms. For example, Instagram sold for around $1B. Had 12 employees. That’s the Future of Work. -Sociology, biological and behavioral science subsumes information technologies for sense-making, knowledge creation, growth and prosperity. Nice post. A few of my povs. 1. The evolution of the business/worker compact: Life-time employment was sought earlier to keep a “work-life balance” and the weightage given to it was high and everything proceeded from the majority of the individuals’ wish to maintain that. Then came the process of self-actualizing(at work alone) compelled by other economic considerations that propelled the current-day work(work consuming individuals) culture. But now everyone starts realizing that this means a complete disruption of “work-life balance” and hence future of work(enabled by the technologies of today(and future) to take care not to miss out on the upside of economics) might trend towards “work-life balance” of the individuals. You have detailed the above process to an extent in co-evolutionary process that you had explained. So put together these will have a huge impact on the future of work. 2. CSR/Social Enterprise: Today many are doing it for reasons of regulations(in some parts of the world), in a cosmetic way, as an image builder, as a marketing tool etc. Future of work would involve doing these in a genuine, sincere contributing way. This will be compelled to a large extent by the flourishing vast online communities both as a colloborator and as a watchful eye(mechanism or process). When the downside is damaging and/or the upside is good, these will become genuine, sincere and more contributing. I think these two will take the future of work a long way and stand the enterprises/companies in good stead and be on top.